I'm such a sucker for Thai food. Maybe it grew from my deprivation of Thai food when I was young. San Jose may have been one of the largest Vietnamese communities outside of Vietnam which is marked by numerous Vietnamese restaurants dotting the city. However, Thai food was a very different story. It was considered somewhat of a novelty and there were some joints in downtown but they were on the pricey side and only frequented by business or corporate types looking to have an exotic lunch. When I used to visit my relatives in Long Beach I'd eat all the Thai food I possibly could. The Thai restaurant scene was so different than that in San Jose as it was considered more humble fare and my relatives new the best joints in town so I couldn't get enough of the delicious flavors.On a recent trip to visit AS, I was introduced to her family's favorite Thai food place. 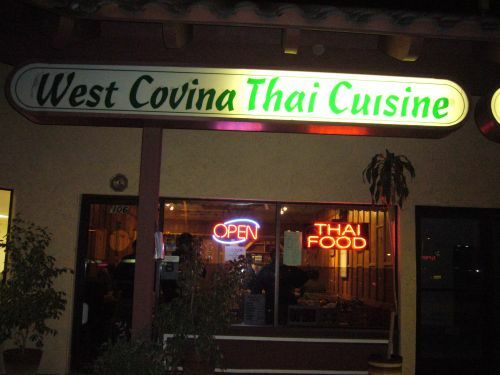 West Covina Thai Cuisine looked like a tiny joint but Angie assured me that the food was awesome and she loves the flavors as much as I do. Within minutes of being seated all the other tables in this joint were filled. Angie remarked that this was rather uncharacteristic as it is usually very quiet when she visits. I thought it was a good sign... when a restaurant is packed its a good sign right? Oh goodness I'd have to give service thumbs down! I suppose the lone waiter and small cooking staff they had wasn't prepared to handle a full house. However, I think its unacceptable when diners are walking straight to the back of the house asking for bowls of rice, looking for drinking cups and take out boxes. It took more than an hour for us to receive all of our food which was very tasty and everything I had expected out of a family run place but the service just marred the food experience. The first item in our order to arrive was the soup. Now we ordered a small Seafood soup($6.95). However what came out was a large Shrimp soup($7.75). I was a little peeved that the waiter didn't tell us of the deliberate change and charged us for the later soup. At least tell us that you can't make former soup!?!? This caused later contention over the bill. I'm really not a cheap person (I tipped 25% on a bill for my alterations a week ago... my guy thought it was too much but the work looked incredibly professional and I looked great in the pieces so I wanted to show my appreciation) but there are some basic things I look for when I eat out. I don't expect service fit for royalty in a family run restaurant but I do expect to get what I order or be notified if it isn't available ... not to be given something and have me figure out that it really isn't what I ordered at all. Sorry for the rant but aside from that the broth was very flavorful- a nice medley of sweet, sour, salty. The shrimp was large, plump, sweet and plentiful. 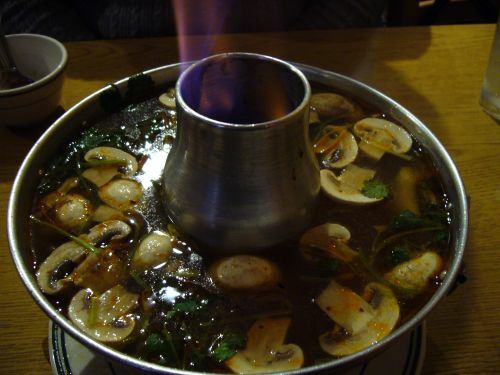 The one thing I'd change in this soup is the monstrous amount of sliced mushrooms you can see floating atop the soup. It got a little mundane eating mouthfuls of the mushrooms, another ingredient would have been nice. Perhaps some sliced tomatoes or bac ha( I don't know the English name but its a spongy plant that looks similar to the taro plant). 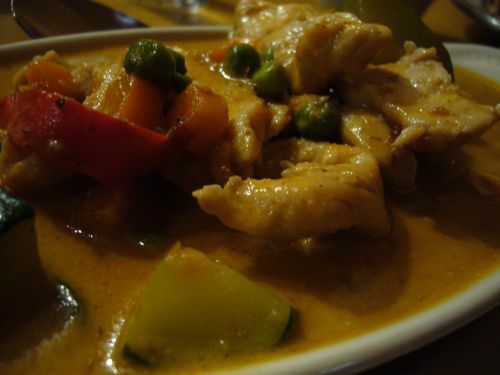 The next item to arrive was the Panang chicken curry ($6.50). It was rich, conconut-y and spicy. The perfect accompaniment to steamy bowl of jasmine rice. The chicken was tender and the vegetable chunks were also cooked perfectly. The final dish was the fried tilapia ($6.50). 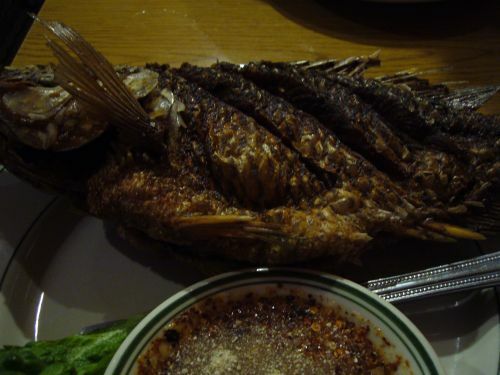 This fish was fried to perfection.. even the bones in fins could be eaten. The meat was tender, sweet and could be easily scraped off the skeleton with the provided spoon. It came with a fragrant spicy fish sauce dip. We couldn't get enough of this dip and smothered the pieces of fish with it. When we were done, it took forever for the waiter to collect the bill so I walked up to the register to pay the bill and ended scrounging around the back for a take out box. There were several unhappy dine-in and take out customers frustrated with the long wait but I suppose they were happy enough with the quality of the food to come back. So like I said... service could use some major improvement but the food was terrific. Oh I hate bad service and switch ups. I would have been seriously peeved. Reminds me I haven't been back to my local Thai place in a while. Yea. I felt like this was one of those situations where a little better service could have gone a long way. I'll be sure to visit you soon! I love Thai food and I miss you. Thanks for the compliment. I get really cheesed off when restaurants have bad service, after all we pay for good food and excellent service. You should network with the moms in the bizymoms west-covina community, they would love to read your posts.